Established in 1997, Mt Romance pioneered the distillation and use of Australian Sandalwood (Santalum spicatum) in the fragrance industry. Today our 60,000m2 facility is the world’s largest distiller of Sandalwood oil, and works to support local and global communities through our commitment to quality, sustainability and ethical business. Our 100% pure Australian Sandalwood essential oil is ideal for aromatherapy and is renowned for its antibacterial, anti-inflammatory and relaxant properties. 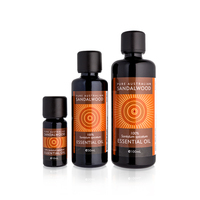 To try a small amount of Sandalwood oil, see our Relaxation Kit which includes 1ml of Sandalwood oil. As well as using local suppliers, we aim to support local organisations and charities through active involvement and sponsorships. We believe a healthy, happy community is critical to our success so at Mt Romance we work with local organisations to help better our community. A unisex, aluminium-free deodorant which contains pure Australian Sandalwood oil, allowing your body to draw upon the fine aroma and anti-microbial qualities of this precious oil, providing long lasting freshness. Soothe and protect your lips with SPF 15 Sandalwood lip care, utilising the nourishing effect of pure Australian Sandalwood Nut oil in a lemon peel oil and beeswax blend. Larrikin is a woody leathery masculine fragrance featuring cedar, pine and a lingering base note of pure Australian Sandalwood oil. Larrikin for men, roll on antiperspirant deodorant reduces perspiration for all day protection. Enjoy the added benefits of pure Australian Sandalwood oil to soothe and protect. This rich and luxurious Body Butter leaves your skin feeling soft, dewy and conditioned with a subtle fragrance of pure Australian Sandalwood oil. 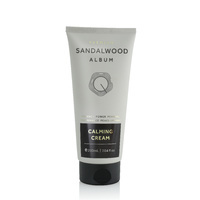 This Hand and Body Cleanser contains Sandalwood oil leaving skin moist and pampered. Free of sulphates, paraben and colouring agents. Let the serenity wash over you with this organic essential oil. Australian Sandalwood has been used for thousands of years by indigenous Australians as a relaxant and to promote focus. A unique journey delivering deep relaxation. Experience The Cone, The Gong and The Bowl today. Amazing use of such a valuable Australian Native resource. Fantastic array of products, not only as a perfume but medicinal uses as well. Really appreciated the impromptu information session. Highly recommended. The men's range is terrific. 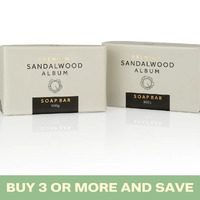 I love the sandalwood fragrance and the roll on deodorant gives me a full day's protection. This is an Aussie run enterprise with mostly Aussie made products - beautiful products... with real sandalwood; not the imitation essence you might get in other companies’ items. We also love ‘The Cone, the gong & the bowl’ meditation sessions! Don’t miss doing one of these. We go twice a week when visiting Albany - so relaxing & such a reasonable price.